Who remembers the collective global outrage when Kim and Kanye West dared to name their child Saint. SAINT! How arrogant, how typical of them etc. A quick google reveals pages of articles and tweets and such filled with disdain.And yet…Saint was really quite a common name in the scheme of things all through the 19th century and either side of it. Usually, to be honest, it was a child born on and named for a Saint’s Day, or one of the more common ones like St John (Sinjin as it was supposedly pronounced by the upper classes). But you can also find ‘Saintley’, ‘Saints’, ‘Sainty’ and the fantastically named ‘Saint David Frederick Borthwick Gilchrist Linley’. So when I came across this particular name, it did briefly cross my mind at how collectively outraged the world would have been if the West’s had named their child Special West. In this case I came across Special West junior first, and both he and his father Special were not celebrities with questionable egos, they were perhaps a sort of opposite of that; Quaker farmers from 18th Century Hertford. 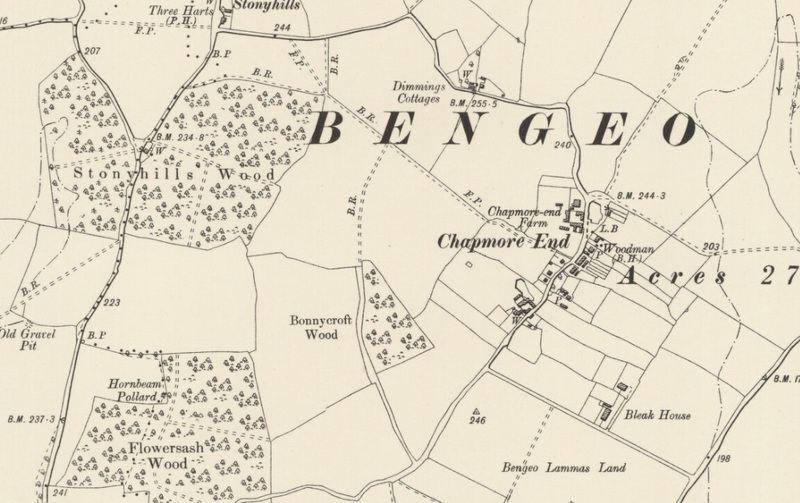 They lived at on Chapmore End farm, leasing the land from a William Baker rather than owning it, in a rather nice bit of countryside (also note the building named ‘Bleak House’ just below!). A barn conversion of the dairy on the property is currently on the market for £2,000,000! Apart from birth and death records, and a marriage for Special snr. – I only have one census record for them, showing Special West jr in 1841, living in Fulford Ambo at the ‘Friend’s Retreat’. I knew The Friends were Quakers and my first rather naive thought on reading the word retreat, was that it was some sort of holiday resort where Quakers from all around the country could meet. Instead it was, and still is, a progressive institution for the treatment of mental health problems. Opened in 1796 by William Tuke, a retired tea merchant, the original Retreat was intended to be a place where members of The Society of Friends (Quakers) who were experiencing mental distress could come and recover in an environment that would be both familiar and sympathetic to their needs. Some years earlier, a Leeds Quaker, Hannah Mills, had died in the squalid and inhumane conditions that then prevailed in the York Asylum, and appalled at this Tuke and his family vowed that never again should any Quaker be forced to endure such treatment. Tuke introduced more humane treatment based on restoring the self-esteem and self-control of residents, with early examples of occupational therapy (walks and farm labouring) and a social environment where residents were seen as part of a large family-like unit, built on kindness, moderation, and order. There was a religious dimension too, but inmates were essentially accepted as potentially rational beings, who could recover through self-restraint and moral strength. They were permitted to wear their own clothing, and to engage in handicrafts, writing and reading, and could wander freely around The Retreat’s courtyards and gardens, in which lived small domestic animals. There was some minimised use of restraint, but physical punishment was banned. Door locks were encased in leather, the bars on windows made to look like window frames, and the extensive gardens included a sunken wall that was impassable yet barely visible. Straitjackets were sometimes used, at least initially, as a last resort. Tuke was initially derided for his methods but they began to shape the way people viewed mental illness in a much more positive light. In the circumstances, Special was probably in the best place he could be at the time. Many records have recently been made available via a collaboration between the Borthwick institute and the Wellcome collection, and I haven’t spotted Special West’s name amongst the available papers so far (I did however come across the records for alcohol purchases, mostly Port and Sherry – the treatment approach obviously wasn’t abstinence based!). However one interesting aspect was that they had a graded payment system, so people from any pecuniary background could be treated there, and the richer people’s assets were used to make up the costs for the poorer patients ‘upkeep’. With this in mind it’s easy to see why people living as far away as south Cornwall made the long journey to York to the retreat. Special himself would have travelled a good 180 miles to go there over any of the closer London asylums, such as Hanwell, or indeed Bethlam (Bedlam). As he doesn’t appear in the 1839 records I would guess that he was admitted after that date. Sadly he dies in September 1842. My own work with a dementia charity makes me wonder if his and many other elderly people’s ‘mental illness’ at the time was actually a type of dementia, however we could never be sure. The records will be available within the next few months so I will report back then. Special was not married and didn’t have any children, so the Special name was not passed down. It was however lovely to come across an nicer aspect of history that greatly interests me, and although a lot of the positive changes were lost later in the 19th century as institutions grew larger and more impersonal, it’s scary to think how much further behind in our attitudes we might be now had the Society of Friends not built The Retreat. What another great article. You are going to have to publish at some stage. I have never come across any Saints (except as the surname of my first mother-in-law – no further comment!) in all my years of family history research but perhaps that says more about my family than about the frequency of the name!! !